NEW BRITAIN - Security Uniforms Inc. is a third-generation family business that started 100 years ago as a dry goods store to help a family make a living. Over the years, the business has transitioned into a specialty store, making security uniforms for businesses, organizations and law enforcement personnel across New England. The business will be celebrating its 100th anniversary on April 25 from 11 a.m. to 3 p.m. with a ribbon-cutting ceremony by Mayor Erin Stewart, food and giveaways. Security Uniforms sells customized uniforms to fire and police departments in cities, towns, college campuses and hospitals. It also makes uniforms for emergency medical service and security workers. The store does not sell uniforms to the general public. The only things the store sells to the public are small items such as gloves and sunglasses. Individuals can walk in with proper identification to buy uniforms and equipment. The business is at 48 Broad St. and is owned by Ross and Ilyse Gottlieb. Ross’ grandmother started the business across the street from the store’s current location. The business’ former name was Goldberg. Through the years, the store changed. In the 1940s through the 1960s, it sold men’s and ladies clothing. Ilyse, who joined Security Uniforms about 18 years ago, said the business started to grow after the terrorist attacks of 9/11 because more places started to add security workers. 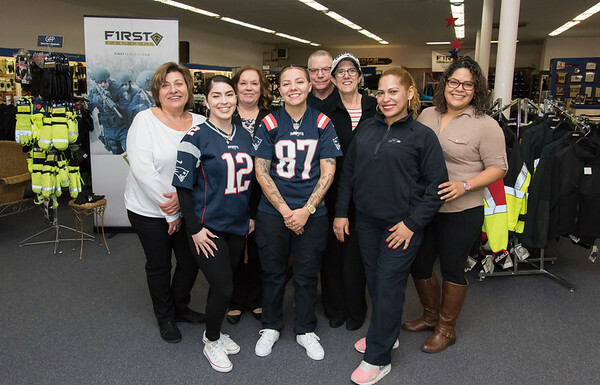 While the business only has one location, in New Britain, it sells uniforms to departments in Connecticut, Massachusetts, New York, and New Hampshire. Because the store offers such a specialized service, the business develops long-term relationships with its customers. “We have people start as Police or Fire Explorers and we see them rise up all the way to be ranking officers,” Ross said. Coordinating orders is one of the challenges the business faces, Ilyse said. The employees stay in touch with customers, giving them regular updates on where their order stands and when they can expect to have it. “That’s the key to customer service: honesty, straightforwardness,” Ilyse said. While there are challenges, the business can also be very rewarding, Ilyse said. Moustakakis has worked at the store for 15 years. Security Uniforms includes an embroidery department, a tailor shop and a heat-pressing area. To learn more about Security Uniforms, call or visit . Posted in New Britain Herald, Business, New Britain on Thursday, 7 February 2019 20:00. Updated: Thursday, 7 February 2019 20:03.